Here are the chickens, after a big week in the shed. This week they kind of sprouted up a little — they’re not so round and fluffy — they’re getting kind of tall and chicken-y looking. You can’t see it from this photo, but they’re starting to stand up and crane their little necks. They survived a couple of really cold nights out there in the cardboard box in the dog crate, so that was a triumph. On Saturday, I built them a bigger box — taped two boxes together so now they have the whole 3’x2′ dog crate — I added that mini-laying box (although they won’t be laying for ages) and a little stick to perch on. I also made a small flat platform for the waterer — they were tipping it and spilling water all over themselves. It was a good decision to keep them in the shed. 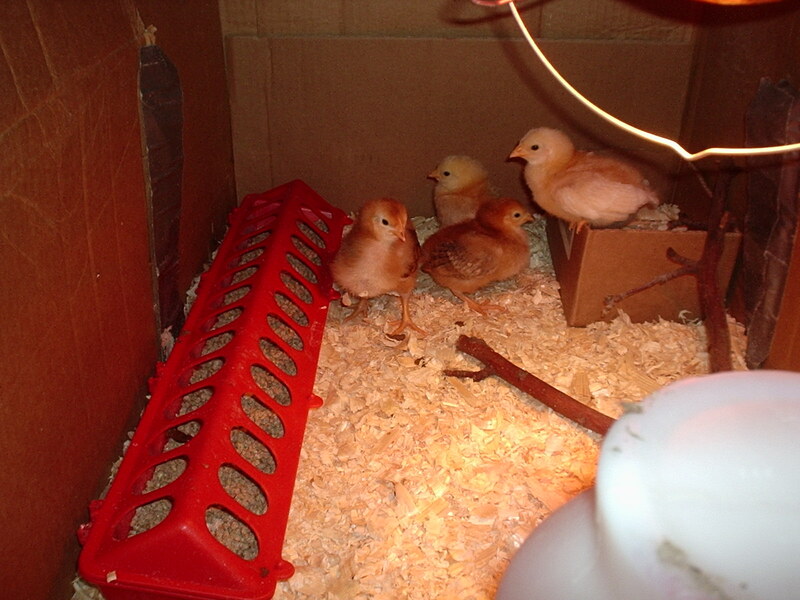 The first week, they were just little peepers — but now they’re starting to smell like chickens. And as fond as I am of the peepers, I have some standards. Dogs in the house are one thing, but no livestock in the house! Next weekend’s project: the coop — that will be fun. I’m not a great carpenter, but even I can build a box, and put it inside another box covered in chicken wire. Photos forthcoming ….